Sterbhaus of Stockholm Sweden who recently signed with Black Lodge will release their follow up to the acclaimed album "Angels for Breakfast ...And God for Lunch" on the 29th of May. 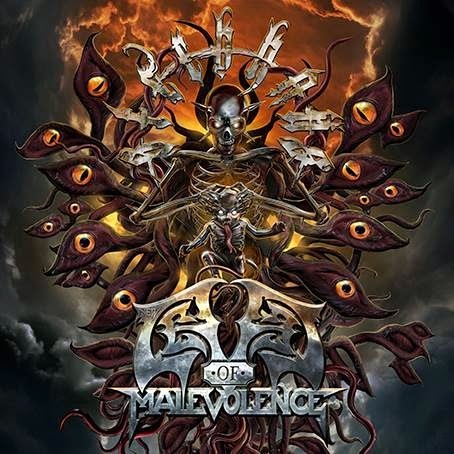 The album is entitled "New Level of Malevolence" and unveiled is now finally not only the tracklist but also the stunning new artwork - true to the preceding release, courtesy of artist Gyula Havancsák (Annihilator, Destruction, Stratovarius etc). On the 27th of March - the very day Sterbhaus is performing at the Black ´n´ Trash Inferno festival in Oberhausen/Germany with Endstille, Nargaroth among others the quartet also releases a first digital single for the song "Necrostabbing the Corpsefinder" taken from "New Level of Malevolence". Sterbhaus who spent 2013 touring as support for Vader, Melechesh and Shining went on to use most of last year finalizing the preproduction as well as finally recording the album during the autumn. Ronnie Björnström (AEON) did the mixing and the band now gears up for heavy touring again. In October Sterbhaus is confirmed as main support for the second leg of "Serpens of Anima" boasting Anaal Nathrakh and Benighted. More tours, shows and festivals are to be announced. "New Level of Malevolence" sees Sterbhaus reinventing themselves once more developing their brand of "Metal Deluxe" - the timeless and honest equivalent of Black/Death/Thrash/Heavy Metal that is neither retro nor modern. For those familiar with Sterbhaus dark and twisted humoristic personality, there is as always a good portion of the bands witful and suspiciously sinister characteristics in both lyrics and music thru out the album.